I don’t know about you kids, but I can’t be trusted in a bookstore. I mean, I love bookstores. I adore them. They’re full of books, and books = my jam. BUT. A bookstore is full of books for SALE, and that can pose a problem for my wallet. I went into a bookstore this past spring with my friend Lauren, and I made some stupid proclamation along the lines of, “I’m not going to buy anything unless they have the exact title I want!” Ha. Hahahahahahahahaha. 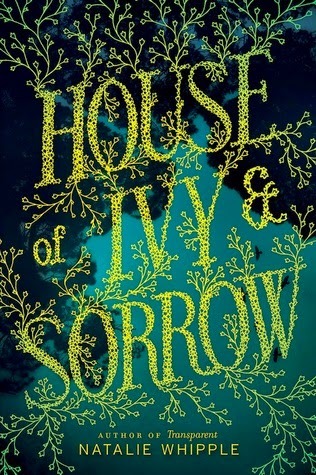 I walked out with the prettiest book I saw in the Young Adult section, Natalie Whipple’s House of Ivy & Sorrow. And I thanked my lucky stars that I didn’t do more damage. What the residents of Willow's End don't know is that there are two witches living in the crumbling old house draped in ivy. Ancient, toothless Dorothea Hemlock … and her seventeen-year-old granddaughter, Josephine. Jo has always managed to keep her magical life separate from her normal one. But now the mysterious Curse that killed her mother—and so many Hemlock witches before her—has returned. Soon Jo realizes that the life she's fought to keep hidden could destroy the one she's worked so hard to protect. Josephine (or Jo, as everyone calls her) is a hereditary young witch living in the back-of-beyond Iowa with her Nana, a formidable (if nearly toothless) power, her two best friends, and her crush-turned-almost-boyfriend, Winn. When a mysterious man appears on their doorstep, Nana looks forbidding, and Jo starts worrying about the Curse, a Black family legacy that killed her mother. From there, things only get more dangerous, as the witchy mystery escalates and Jo tries to keep it together at school and at home. I think this book wanted to be a lot of things. It wanted to be funny, with snappy dialogue. It wanted to pose deathly-serious consequences to magic-gone-wrong. It wanted to be a sweet, first love kind of romance with just enough tension and another boy on the horizon to keep things young-adult-fiction-interesting. What it managed, in the midst of all that striving, was to give me a headache. The issue, as I see it, was tone + worldbuilding. While it is possible to do light-hearted plus dark (see: Sarah Rees Brennan’s Unspoken), House of Ivy & Sorrow didn’t hit that level. I felt like I had whiplash: first reading a scene of mild embarrassment over sitting next to a boy on the bus, and then an abrupt shift to tearing out teeth, gouging skin, or pulling hair out by the roots to make a powerful spell. The dialogue was frequently fresh and fun, but it didn’t match the magical system, where the ‘sacrifices’ practioners had to make were horrible (but never seemed to incapacitate) and the reasons for doing them either terrible or vague enough as to seem unnecessary. Long story short, it didn’t gel. Main character Jo had strengths and weaknesses, and it was refreshing to read a book where a young magic-user gets things wrong and fumbles around a bit (as you’d expect anyone new to a skill would!). I also appreciated the small town setting, her healthy female friendships, and their realistic banter. That said, Jo’s reactions under pressure were… not mellow, exactly, but not urgent. And that didn’t match the sarcastic, smart, difficult girl she was supposed to be. Let’s review: there was the matter of tone, discussed above, and various other inconsistencies (for example: these witches are always harming themselves… so how does no one notice that Jo isn’t completely covered in scars/bruises?!) that interrupted any flow before it could really get going. Additionally, what I would call the essential elements of a good fantasy/paranormal were the weakest bits. It was trying for spooky but not laying the groundwork for the proper atmosphere. In all, House of Ivy & Sorrow was a mixed bag of a book. It didn’t work for me, but I think it will appeal to those who aren’t regular readers of fantasy. Recommended for: fans of Aprilynne Pike’s Wings or Kiersten White’s Paranormalcy, and those who like a mix of not-too-dark and light in their YA reading. Too bad it didn't hang together very well! It's a nice cover -- I was attracted to it in my own bookstore recently.